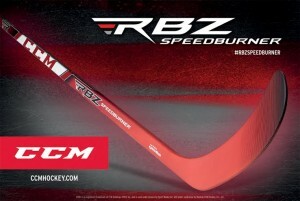 On August 14th, another technologically advanced hockey stick will hit the market and hockey fans all across the country are lining up to see what the CCM RBZ Speedburner stick is all about, and if it will live up to its hype. This CCM RBZ Speedburner stick will be an upgrade from anything we’ve seen before in the existing RBZ line and the biggest improvement is going to be maximizing the speed of the puck creating one of the quickest shots on the ice (hence the name speedburner). RBZ has introduced the Power Hosel Technology in this stick, which helps transfer the power while still creating a durable stick (two incredibly important things for players). The new rib inside the hosel helps maximize the energy transfer and increase durability by extending all the way through the length of the shaft creating more efficient load transfer, strength and durability. Many pros and product reviewers are saying the Speedburner has the most pop and provides the hardest shot on the ice, more than any other RBZ sticks to date. The only downside we’ve seen of this stick may be learning to control the power when simply passing, rather than taking a hard shot in the net. As for the blade (with help from TaylorMade), it provides a unique trampoline effect (C.O.R. ), which will maximize puck speed, thanks to their brand new speed pocket construction. The speedburner is a light stick that doesn’t offer as much flex as some of the other hockey sticks on the market, but the stick does allow for the player to load a powerful shot from top to bottom, creating maximum power. While the stick does have some flex, it is based on the player’s bottom hand, making it perfect for any shot – even defenseman are loving this stick thanks to its custom kickpoint – something that has been a constant in all RBZ sticks. The Speedburner has an extremely low swing weight, which helps distribute weight better throughout the entire stick giving the player a faster swing speed. To be one of the first to buy this stick, visit one of our Hockey World locations or snag it online here. If you have a review or question on this stick, please leave us a comment on the blog post – we’d love to hear your thoughts!